In March 2006, I went for the very first time into a real prison. I participated in a tour of the recently-closed prison in Luckau, a small town south-east of Berlin. We were informed that the various prison buildings would be converted into a cultural centre. First of all, we visited »Jailhouse II«, a former monastery, which was founded by the Dominicans in the 14th century. It was later used as an orphanage, and from 1747 until the autumn of 2005 as a prison. We climbed up the trodden out steps of the ice-cold stairway, which appeared to have been stored in the masonry since the beginning of time. I felt very sorry for every person who ever had to use this stairway. In contrast to these impressions, the cells were painted in unexpectedly bright colours. They appeared to have been just recently vacated by their occupants. A few months later I was commissioned to document the whole prison area. »Jailhouse I«, »Sachsenwerk«, where all the workshops had been located, the kitchen, the gym, the administrative building and »Jailhouse II«, which you see here. 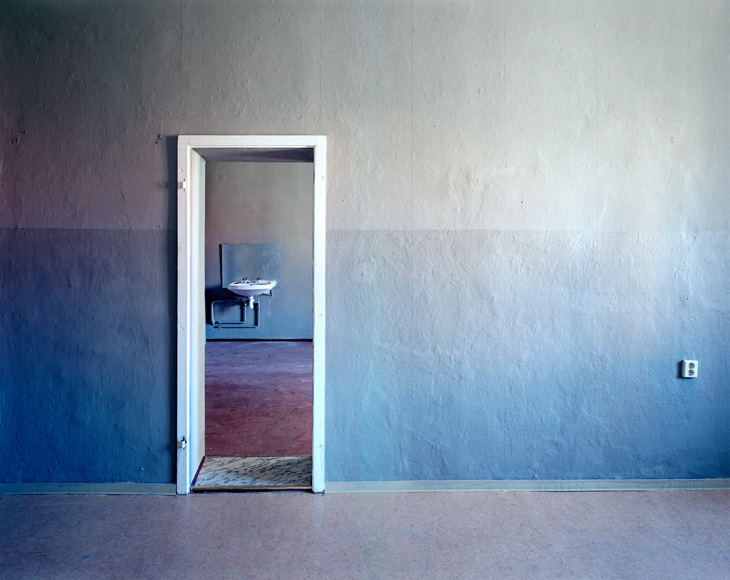 I decided, against my own convictions, to work in colour, in order to document the special arrangement of colours in the cells and communal rooms. On a hot day in June 2006 the prison gate was opened for me, and I stood alone in the yard with my equipment. I was assured that the gate could be opened from the inside at any time, which reassured me considerably. In the basement of »Jailhouse II« I was greeted by very humid air and a wall covered with black mildew. As I climbed up the stairs the air got warmer. On the top floor, underneath the flat tin roof, the air was unbearably hot. There was a strange odour, a mixture of sweat and the smell of dead pigeons. They had entered the building through broken windows, but had no longer find their way out. Nevertheless, this floor was the most interesting for my work. The cells were still furnished with beds, tables and wardrobes, even plastic plants. During my work, the thought came to mind that the inmates could not simply step outside to get some fresh air, as I did several times. After one and a half years of construction work, the former monastery was reopened in 2008 and is now called »Kulturkirche«. It accommodates the new permanent exhibition of the »Niederlausitz Museum«. In 2009, the public library moved into the building and an exhibition about the former prison was opened under the title »Im Knast. Strafvollzug und Haftalltag in Luckau, 1747-2005«. In a room – »Haftzelle bis 2005« – that is furnished like a former cell, my whole photo documentation is displayed on a screen. It can be viewed sitting on a prison bed.